What is Lovely face fat grafting? As a result of aging, fat is gradually absorbed, which reduces volume and elasticity,resulting in a curved and saggy face. There are a variety of ways to improve this, but the most preferred way to improve the overall face is fat grafting. It is Braun’s unique method of fat transplantationwhich fills in sunken areas, creating a more three-dimensional, voluminousoval facial contour to make you look younger and lovelier. It is a young, lively and lovely face type achieved by lifting the center of the face beneath the forehead, nose, under the eyes and cheeks, forehead, forehead, jaw tip, etc. It eliminates the curve from sunken and saggy areas of the T-zone, from forehead, nose, under eyes, cheekbone, nasolabial fold, cheek to tip of chin, fills it in with volume, and lifts the center of face to give the face a younger, vivid, and lovelier look. After consultation with a specialist who is experiencedwith fat grafting, we design the area. After sedative anesthesia, fat is extracted from the thighs or abdomen. The centrifugal separator removes impurities and extracts only pure fat cells. 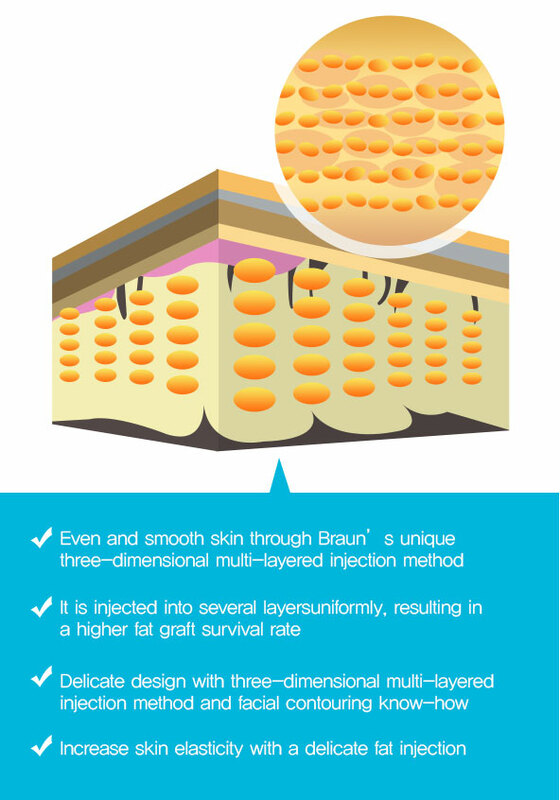 We use a three-dimensional multi-layered injection method using autologous micro fat. 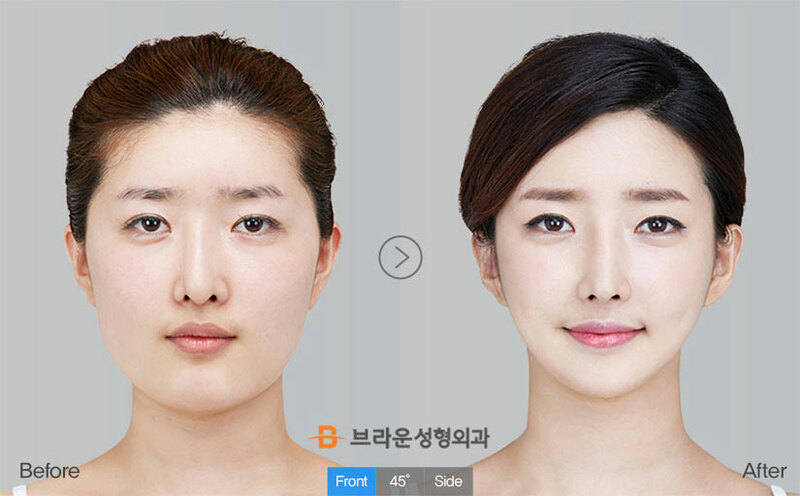 Within 2~3 months, the stored fat is transplanted to complete a more voluminous face. It gives volume to the front cheekbones to give the face a sophisticated and glamorous look. It creates a smooth jaw line and naturally connects the forehead, nose, and chin to give a sophisticated look. It has an effect on protruding mouths as well. As a result of aging, fat is gradually absorbed, which reduces volume and elasticity,resulting in a curved and saggy face. There are a variety of ways to improve this, but the most preferred way to improve the overall face is fat grafting. It is Braun’s unique method of fat transplantationwhich fills in sunken areas, creating a more three-dimensional, voluminousoval facial contour to make you look younger and lovelier. It is a young, lively and lovely face type achieved by lifting the center of the face beneath the forehead, nose, under the eyes and cheeks, forehead, forehead, jaw tip, etc. It liminates the curve from sunken and saggy areas of the T-zone, from forehead, nose, under eyes, cheekbone, nasolabial fold, cheek to tip of chin, fills it in with volume, and lifts the center of face to give the face a younger, vivid, and lovelier look.